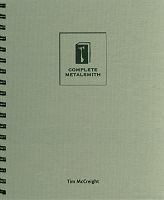 Craftspeople and teachers throughout North America have adopted The Complete Metalsmith as in indispensable resource. Now revised and expanded, this classic handbook gives fuller coverage to familiar techniques and adds many new procedures to its already encyclopedic breadth. The straightforward text and instructive, clear drawings bring even complicated techniques within everyone's reach. Covered are materials, surfaces, shaping, joining, casting, stones, mechanisms and tools. Extensive charts and tables, supplemented and updated in this edition, offer valuable information and resources. The wire binding makes this guide thoroughly practical for both studio and classroom use. Highly recommended. 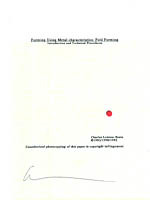 Soft cover, 5.5" x 8.25 ", 154 pages. Craftspeople and teachers throughout North America have adopted The Complete Metalsmith as in indispensable resource. The professional edition of this classic handbook covers additional smithing and jewelry making topics and provides even more in-depth information. The straightforward text and instructive, clear drawings bring even complicated techniques within everyone's reach. The diagrams and drawings in the standard edition are rendered with black and white, the profession edition features color. Covered are materials, tools, shaping, surfaces, joining, color, finishing, casting, stones and stonesetting, chains and claps, findings and mechanisms. Extensive charts and tables offer valuable information and resources. The wire binding makes this guide thoroughly practical for both studio and classroom use. Highly recommended. Hard cover, 8" x 9", 299 pages. Forming Using Metal Characteristics: Fold Forming presents a system of sheet metal forming that emphasizes forming using the metal's characteristics. Forms are derived from the natural plasticity, ductility and elasticity of the metal. Fold forming is extremely efficient and rapid. Simple tools: fingers, hands, hammers, mallets, anvil and rolling mills. There is a theoretical introduction and step by step recipes for working sheet metal. An Introduction to Fold Forming Video is also available. Soft cover, 8.5" x 11", 45 pages. 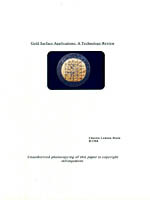 Gold Surface Applications: A Technology Review discusses fusion applications (gold "painting"), doublee, Keum-boo, depletion gilding, inlay and overlay procedures, and fire guilding. 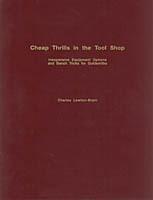 Soft cover, 8.5" x 11", 32 pages. Packed with outstanding demonstration photos, brilliant work from top contemporary artists, and instruction from a master teacher, this volume belongs in the library and studio of every practicing and aspiring metalsmith. 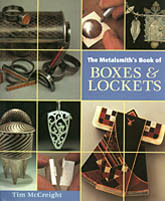 The Metalsmith's Book of Boxes and Lockets introduces a variety of metalworking techniques for box construction, hinges and closing devices. Guided by detailed demonstration photos and McCreight's expert instruction, even novice metalworkers will be ready for the challenge of designing their own boxes. The challenge of designing original boxes is supported with every turn of the page. The projects presented are a feast for the eyes and rich source for the imagination. Highly recommended. Hard cover, 9" x 10.5", 141 pages. 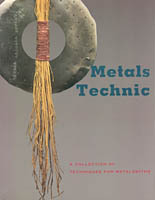 Metals Technic presents twelve articles representing the research, creativity and generosity of a dozen metalsmiths. The information presented is a composite of years of research and teaching experience, presented in the hope of making your own experimentation more rewarding. Covered are Sterling Granulation, Niello, Anticlastic Raising, Nonconforming Dies, Cold Connections, Fold Forming, Toolmaking for Jewelers, Kum-Boo, Depletion Gilding on Tumbaga Alloys, Patination, The Instant Etch Process and Reticulation. Soft cover, 8.5" x 11", 151 pages. 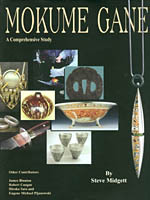 This comprehensive book provides solid information about the process of mokume gane (wood grain metal). From its beginnings in ancient Japan to its current renaissance in the digital age, the author traces its history and applications. With the help of other prominent artists in the field, he provides detailed instructions for metalsmiths, jewelers, and knifemakers who want to produce their own quality mokume. Each technique is thoroughly covered, with tips from the finest makers in the world. The text is copiously illustrated with over 150 color photos and includes 25 pages of mokume gane art by accomplished masters. All the technical data is here too, with step-by-step instructions, information on metal compatibility, and firing temperatures. All this and more makes Mokume Gane A Comprehensive Study an essential reference for any metalworkers shop. A Mokume Gane in the Small Shop how-to video by Steve Midgett is also available. Silversmithing and Art Metal explains with the aid of pictures and diagrams contemporary methods of hand forming silver, copper and related metals into useful and decorative objects. The information and techniques presented have been gathered, tried, and developed through many years of actual work as a craftsman. Covered are tools and equipment, the metals, metal working techniques, forming techniques, plate and tray construction, box construction, spoons, picture frames, and spouts, decorative processes, and silversmithing and art metal projects. 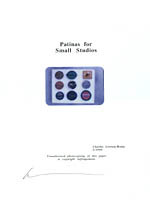 Soft cover, 7.5" x 10.5", 176 pages. 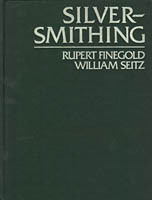 The chapters in Silver-Smithing follow a logical sequence from the simplest to the most complicated techniques and procedures. General principles, materials, tools, and processes are covered first. 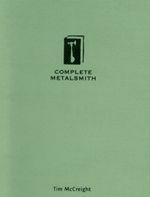 Part One, Introduction to Silversmithing, includes chapters on General Principles of Metalwork, Properties of Metals, Tools and Equipment, and Custom Making Tools. Next, operations that may be applied in different ways to many different projects are described in their general application so that they may be combined in any way that your specific design requires. Part Two, Basic Treatments, includes chapters on Annealing, Soldering, Pickling, Using Abrasives, Polishing, and Chasing and Other Surface Treatments. Part Three, Basic Tools and Their Use includes chapters on Cutting Stock, Filing, Hammers, and Stakes, Anvil Heads, and the Snarling Iron. Part Four, General Procedures includes chapters on Working Positions, Design, Working Drawings and Templates, Sizing a Metal Blank, Stamping the Work, Regulating and Truing, Planishing and Bouging and Repairing Work in Progress. 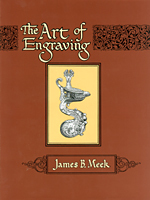 Part Five, Special Procedures, includes chapters on Curving Flat Wire for General Use, Making a Wire Rim for a Bowl, Making a Round Rim, Wiring an Irregular Rim, Thickening an Edge, Making a Base with Flat Wire, Making a Base by Raising with Crimping, Seaming, Casting, Taps and Dies, Making a Spout, Making Ferrules, Pinning a Handle, and Making Hinges. Finally, a series of projects are presented to show how the general procedures are put together in the process of working a pieced from start to finish. 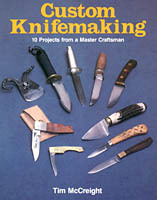 Part Six, Projects, includes chapters on Sinking a Bowl, Sinking a Plate and Tray, Making a Bowl by Raising with Crimping, Making a Bowl with Raising without Crimping, Raising a Creamer with Self-Spout, Constructing a Box, Forging Flatware, Forging a Punchbowl Ladle, and Stretching a Gravy Boat. An Appendix covers Metal Wire and Sheet Silver, Tools and Supplies and Weights and Measures and a Metalworking Glossary is provided Hard cover, 7" x 9.5", 460 pages. Since the first publication of The Theory and Practice of Goldsmithing in East Germany in 1961, this book has sold over 100,000 copies in Germany and Russia and established itself as a dominant resource for jewelers, sculptors and others involved in small scale metalwork. Early chapters discuss materials with focus on the noble metals (gold, silver and platinum) and detailed coverage of jewelry alloys. Chapter 3 provides a comprehensive description of chemistry related issues for studio metalsmiths, and in Chapter 4 Dr. Brepohl offers instruction in the physics of material usage that is both rigorous and practical. In later chapters this valuable resource explains the mechanisms of soldering, eutectic bonding and electroplating. Studio artists will find the information on silversmithing, chainmaking and findings especially helpful. Closing chapters cover gems, stonesetting and jewelry repair. 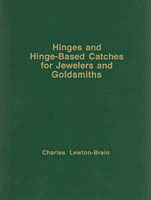 Chapters include: Metals, Other Materials, Studio Chemistry, Handling Metals, Handworking Skills, Silversmithing, Machine Tools, Joining Techniques, Finishing Techniques, Specialty Techniques, Plating Technology, Settings & Findings, and Repair Work. 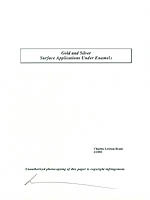 An appendix includes Alloy chart, Temperature Conversions, Relative Sizes, Conversion Formulas, Equivalent Numbers, Sawblade and Drill Bit Sizes, Fineness of Gold, Thickness of Copper sheet, Weight Conversion Calculations, Bibliography, Suppliers of Metals, Suppliers of Other Materials and a comprehensive Index. With the publication of this English-language edition a new and eager audience will have access to this practical volume. 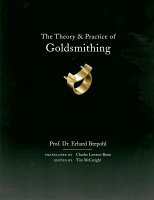 The detailed illustrations and data-rich tables insure that this edition of The Theory and Practice of Goldsmithing will, like its German forebears, again earn a central position in the literature of the field. Hard cover, 8" x 10", 536 pages.